What is the Hearthstone Tourney? Welcome to the first ever TehMonitorTV Hearthstone Tourney! This is a fan made community event that anyone is allowed to participate in! It was originally thought up by streamer MrrKnight and together we have created this event! It is as previously mentioned, open to everyone, streamers and non streamers alike! This was put together so people can come together in a fun environment and get to know new people they might not have otherwise had a chance to meet. 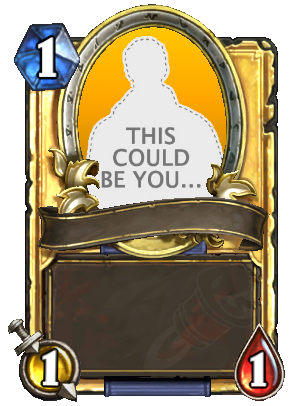 So, whether you are a Hearthstone noob, or even just a sideline viewer, we hope you join us for this event! So, some of you may be asking, what is the point of all this aside from community fun? Well, the short answer is, almost nothing! We may or may not have prizes based on the number of signups we receive, but we as gamers have always played games for just that, fun! I mean, do you play Mario Party or Call of Duty to win something other than being the winner? Well, during this event we will be raising money for charity. More on that in the next section. All of the matches will be streamed and you can hang out and watch every single one of them in real-time and make new friends! If you are a Hearthstone player, you can brag about your rankings! Overall, it is just that, good clean fun on Twitch. Because this event will hopefully be a big community event, we wish to use this as an opportunity to promote a charity and a cause that we can all get behind. Now I know we all have been affected by cancer in some way, shape, or form. Year after year we continue to donate, do research, and expand our efforts against such an evil curse on Earth, and so if you feel so inclined we will be asking for donations to help cure it. ​ Donating is of course not required, but with the hopeful goal that this tournament will be successful, we wish to use that to the world's advantage. So please, if you can, donate for a good cause, or at least spread the link around, to both gamers and non-gamers alike. The money does not pass through our hands and will go to them directly through our team page. In advance, we thank you for your kindness. We will be reading off donations during the event. - You must make 3 decks. Each deck must be a different hero. - For each deck, only one legendary is allowed. - Wild Decks will be used in this tournament. ​-Decks cannot be changed once you entered your decks. Your decks must be used throughout the whole tournament (so choose wisely). ​-To submit a deck, you must submit a list of your decks (below) and a confirmation will be sent that we got your deck. If we find that you stream a card that is not listed, you will be instantly disqualified. - If you lose your first match, you can not use the same deck. Example... First match... You use a mage and lose, you must use one of your other 2 decks for the remainder of your match. - If there is an error with your match that is out of your control such as a power outage or internet failure, it will NOT count against you. Your match will be rescheduled. Repeated failures though will result in your disqualification. Nothing personal, but we must keep the tourney moving forward, but we will do our best to work with you. - The dates of this tourney are to be announced after signups are complete. - We are hoping to have this set up and started by August. - Sign ups will end on July 31st, 2016. - All matches will be streamed and will require a battle.net friend request. - When submitting your deck, you can just post a link to the image of your deck on a site such as imgur. - This is a fun, community oriented event. Light teasing of your opponent can be good fun, but anything more will be taken as harassment and not be allowed. - Currently there will be no prizes other than the glory of winning in front of a live audience. - Any questions can be asked in our community discord: https://discord.gg/​0fIU7P5RxUH5YIQh just say that you have joined the chat because of the tourney.